AUSTIN (Texas Tribune) – Ten votes. That’s the razor-thin margin by which a young Dennis Bonnen — two years out of college — made it into the 1996 Republican primary runoff for House District 25. Those votes separated him and third-place finisher Arch “Beaver” Aplin III, the man behind the Buc-ee’s convenience store chain. The 24-year-old Bonnen went on to win the runoff and general election, becoming the youngest member of the House at the time. Twenty-two years later, he is weeks away from taking it over. 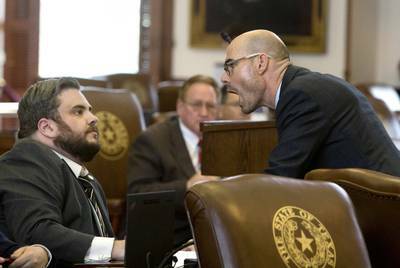 Bonnen’s ascent to presumptive House speaker caught many by surprise. But those who know him have learned not to count out the kid who almost missed that 1996 runoff. From his childhood in Angleton to his emergence as a key player in the House, they say, Bonnen has proven to be hard-charging and, at times, frenetic in pursuit of his goals, even if it means ruffling some feathers along the way. The following account of Bonnen’s rise to power is based on interviews with over a dozen of Bonnen’s friends, associates and colleagues and local press reports. Bonnen declined to be interviewed for the story. Bonnen was born on March 3, 1972, in Houston. At the time, his family lived about 45 minutes south of Angleton, which would be the backdrop of his youth until he left for college 18 years later. His father was a well-respected attorney in town, while his mother was a homemaker active in the community, particularly with the local libraries. Bonnen’s family — he was the youngest of four — was “very, very strict” and “very, very demanding,” recalled Winder, who was also a neighbor and would later work in his district office. She said Bonnen was the only student she ever hit, striking him on the hand as he came in late to a class “popping off.” After the class, Winder called Bonnen’s mom to tell her about the incident. “She immediately said, ‘Hit him again!’” Winder said. Still, back then, Bonnen exhibited a distinct industriousness. He mowed lawns and had a paper route, played baseball when he was younger, then soccer in high school. He sold advertising for the student newspaper, memorably winning an award for an ad he had hastily composed at the last minute. Bonnen had put a tiny logo at the bottom and left the rest of the ad blank. That was much to the dissatisfaction of Winder and another teacher. At the Legislature, Bonnen has talked little about his dyslexia. But as part of a 2012 deposition in Texas’ long-winding voter ID case, he acknowledged he suffers from the disorder, preferring to communicate with staff verbally instead of over email. 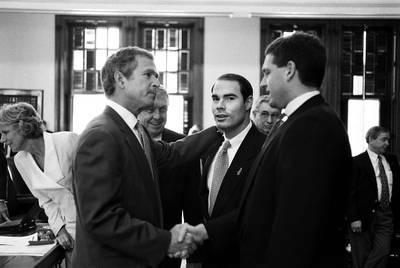 After graduating from Angleton High School in 1990, Bonnen went to St. Edward’s University in Austin, where he studied political science. His professors remember him as outgoing and intense. Richard Daly, who taught Bonnen in a class about the legislative process and lobbying, said he was “part of a very, very energetic group” of students at the time. Neal Wise, who had Bonnen in a number of courses, said he could not remember Bonnen missing a single class. The now-retired professor said Bonnen was particularly impressive in his political theory class. A few years later, when Bonnen was first running for the Texas House, Wise took his students to the district to walk precincts. It was during Bonnen’s time at St. Edward’s that he got his first real experience at the Texas Legislature. In 1993, he got a job as a House sergeant-at-arms, which made him responsible for helping keep order in the lower chamber. After graduating the next year with a political science degree, he set his sights on the nation’s capitol. He spent the summer of 1994 interning for a congressman who represented his part of the state, Greg Laughlin, a conservative Democrat who would switch to the GOP the next year. Following the internship, Bonnen went to work for the Can Manufacturers Institute, the national trade group representing manufacturers and suppliers of metal cans. And in 1995, he joined Bob Dole’s presidential campaign as a member of the advance team. By the latter part of the year, though, Bonnen was beginning to think about politics closer to home. 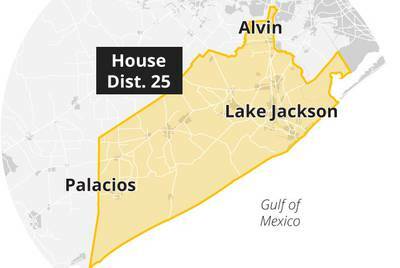 The longtime state representative, Republican Jack Harris, had announced he was not seeking re-election to Texas House District 25, instead running for a seat on the Brazoria County Commissioners’ Court. Bonnen left the presidential campaign, returned to Angleton, and on the weekend before Thanksgiving, launched his campaign. Bonnen’s first election turned out to be a memorable one, with his narrow defeat of Aplin in the four-way primary — and a subsequent recount that Bonnen survived. In the runoff, Bonnen easily defeated the first-place finisher from the primary, a freelance writer from Alvin named Dianne Hensley. He went on to rout Democrat David Miller in the general election. 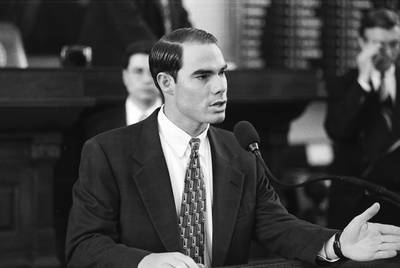 At 24, Bonnen became the youngest member of the Legislature at the time. “Probably the biggest thing from that race is that Dennis worked so much harder than any of the other folks,” recalled Brazoria County Judge Matt Sebesta, who was an Angleton City Council member at the time. 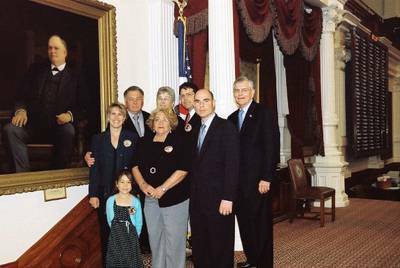 Bonnen benefited from his parents’ sterling reputations in the community, Sebesta added, but Bonnen did not rely on them, “busting his tail off” to prove his own mettle. Bonnen has not forgotten about that first election. 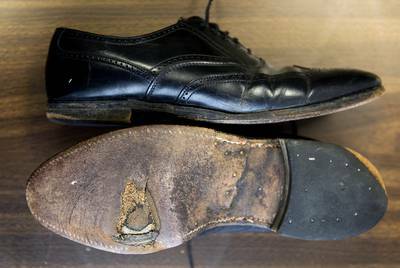 In his office, he keeps a pair of shoes with weathered soles that he used to block walk during the race. The shoes Dennis Bonnen wore during his first bid for a House seat in 1996. Miguel Gutierrez Jr. He campaigned as a fresh face for the district, with one newspaper ad touting him as the “one candidate in this race with the energy and relentless dedication to fight for our values and concerns in Austin.” Yet the 24-year-old Bonnen also faced questions about whether he was ready for the job — questions the former House sergeant-at-arms characteristically dismissed. Bonnen arrived in Austin for the 1997 session eager to learn the ropes, and he quickly found a mentor in Brazoria County’s other — much more senior — representative, Tom Uher. 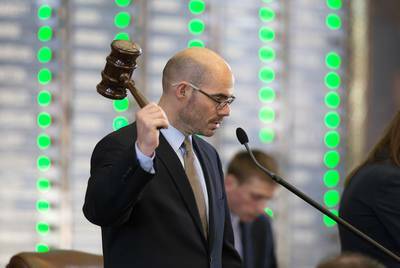 At the time, the Bay City Democrat was on his 16th session and serving as speaker pro tem — a position Bonnen would earn 16 years later. During his first few sessions, Bonnen built experience serving on an array of committees: County Affairs, Insurance, Ways and Means, Pensions and Investments and Environmental Regulation. At the polls, he faced little to no opposition as voters rewarded him with term after term. But as he gained seniority in the House, Bonnen also developed a reputation as a brawler. While he chaired the House Environmental Regulation Committee from 2003 through 2008, environmental groups accused him of slow-walking legislation they supported and for having a deaf ear for bills viewed as unfriendly to polluting industries in his district. They used terms like “combative” and “rude” when asked to recount how Bonnen treated them. In 2009, San Antonio Republican Joe Straus kicked off a decade-long run as Texas House Speaker that coincided with a pivotal period in Bonnen’s political career. That time included several stepping stones that would ultimately solidify Bonnen’s role as a leader for the lower chamber, according to many of his colleagues. He became vice-chair and then chair of the influential Sunset Advisory Commission which is charged with periodically assessing and renewing the charters of state agencies. And when then-speaker pro tem Beverly Woolley of Houston announced she would not seek re-election in 2012, there was an opening to be Straus’ second in command. Bonnen was that guy, entering a role that would set him up to be a mouthpiece for the Texas House and, eventually, the most visible lawmaker charged with navigating the murky waters between the House and the increasingly conservative state Senate. That year was also notable in another way for Bonnen. He was joined in the House by his oldest brother, Greg Bonnen. A neurosurgeon from Friendswood, Greg Bonnen won the race to replace outgoing state Rep. Larry Taylor, R-Friendswood, who had successfully run for Texas Senate that year. In the 2015 session, Bonnen’s profile continued to rise. He not only remained speaker pro tem, but was selected to chair the tax-writing Ways & Means Committee. He also became the go-to lawmaker for carrying high-priority bills through the chamber. He carried the House’s tax-cut proposal, a $4.9-billion relief plan that would have lowered sales taxes and served as the chamber’s response to a Senate-backed plan focused on property taxes. He also authored a sweeping border security measure that beefed up staffing for the Texas Department of Public Safety. It was during that same legislative session, lawmakers say, that Dennis Bonnen gained a reputation as the House’s top advocate — someone who was unafraid to speak boldly about the chamber’s position even if he ruffled the feathers of those on the east side of the Capitol. Last year, some lawmakers say Dennis Bonnen added another unexpected role to his legislative responsibilities: mediator. Dutton recounted an instance during last year’s regular legislative session when tensions between the two chambers were high. House lawmakers were frustrated with the Senate’s inaction on several bills authored by House members. And Dutton delivered a rousing speech expressing the chamber’s frustration that included the line, “When the Senate won’t respect us, they need to expect us!” Bonnen quickly tried to address the issue with Lt. Gov. Dan Patrick, who oversees the Senate. “He shared what was the mood of the House, which is that we were all upset that some House bills over in the Senate hadn’t even gotten a hearing and, in some cases, hadn’t been appointed to committees,” Dutton said. Bonnen also helped arbitrate escalating battles between Straus and Patrick, who were deadlocked over a slew of issues including how much to limit cities and other local entities’ abilities to collect property tax revenue — and, most controversially, a “bathroom bill” that would have restricted the use of certain public facilities for transgender Texans. The differences between the more moderate House and more conservative Senate were emblematic of a larger war within the Texas GOP over how far right to take the party. And Bonnen was the House member who championed the lower chamber’s version of property tax legislation. Despite battles within the chamber, he successfully got a property tax bill through the House. By the end of two sessions last year, the House had fought off Patrick’s hopes for legislating transgender Texans’ bathroom usage and constraining how much property taxes local entities could collect. And Patrick, too, often found himself in Bonnen’s crosshairs. The House member publicly pushed back after Patrick claimed that the Senate’s property tax legislation would be the “strongest tax reform and tax relief bill ever passed.” He also publicly called out various local leaders and state officials active on the issue for spinning narratives about property tax legislation that he said simply weren’t true. The two chambers never ironed out their differences and a property tax measure never passed — teeing the issue up to once again be a major point of contention between the House and Senate come January. Despite gaining a reputation as the House’s defender, Bonnen has also angered some of his colleagues in the lower chamber. During the floor debate over an already-controversial bill banning “sanctuary” jurisdictions that prohibit local police from cooperating with federal immigration authorities, state Rep. Matt Schaefer, R-Tyler, proposed a divisive amendment allowing local police to ask people they legally detain about their immigration status. Democrats blamed Bonnen for pulling the plug on a last-minute deal to kill the amendment. The bill — with the amendment tacked on — eventually passed with Bonnen’s support, and was soon signed into law. While 30 Democrats eventually came around to back Bonnen’s speaker bid, many — even some on Bonnen’s initial list of supporters — said that episode still leaves a sour taste in their mouths. “I was not on the list [of Bonnen’s pledges] to honor the concerns of a large percentage of Mexican-American Legislative Caucus members about the anti-Hispanic tone of recent sessions,” state Rep. Rafael Anchia, D-Dallas, previously told The Texas Tribune. To be sure, Bonnen has had other self-inflicted wounds. In 2009, he drew criticism when he said during a House floor debate that Hispanic women were not traditionally encouraged to leave home after high school. Years later, he told the Tribune that a Latina member of the 81st Legislature at the time had agreed with his assessment and told him as much. In a 2014 House committee hearing, he used the derogatory term “coonass” while discussing children coming to Texas in the aftermath of Hurricane Katrina. He later apologized for using the slur. At the same time he was climbing the ranks of House leadership, Bonnen was building his career back home in Angleton. When he was first elected to the Texas House in 1996, the 24-year old was working for a local data systems company. Over the next few years, Bonnen found work in the insurance industry and in sales, according to financial statements he filed with the Texas Ethics Commission. Roughly 15 years ago, Bonnen switched over to a career in banking, joining First Community Bank in Houston as senior vice president in business development. He went on to work for other banks in the area before becoming president, CEO and chairman of Heritage Bank in 2008 — titles he still holds today. As Bonnen described in a 2012 issue of his alma mater’s magazine, it’s been important for him to keep his “day job” while serving as an elected official. Under Bonnen’s leadership, a number of state lawmakers and lobbyists have held investments or leadership roles in Heritage Bank, including two who still do: Rusty Kelley, a high-profile, Austin-based lobbyist, and state Rep. Dan Flynn, a Canton Republican. Both own stock in the bank, according to filings for the 2016 fiscal year; Kelley is a former member of the bank’s board, while Flynn still sits on it. Though the state’s ethics laws are vague and full of loopholes, Bonnen’s business ties could draw more attention as house speaker. The Texas Constitution requires members who have a direct “personal or private interest” in a bill to both disclose that fact and then not vote on it. But how “interest” is defined varies among lawmakers. That provision also doesn’t often directly impact speakers of the house, who rarely vote on measures but can still be enormously influential on whether any bill makes it to the House floor for a vote. That sentiment — that Bonnen’s work in the community stretches far beyond his work in state government — rings especially true for Jessica Phillips. She and her husband, Chaney, both went to high school with Bonnen. The three maintained a friendship as the couple got married and had three kids. Brooke, the couple’s middle child, died when she 5 after being diagnosed with leukemia. In 2007, the couple co-founded B.I.G. Love Cancer Care Services, a non-profit that helps kids with cancer and their families. Jessica Phillips said Bonnen was “instrumental” in helping her and her husband get their nonprofit off the ground. He also served on its board of directors for its first eight years. He now works in an advisory role, Jessica Phillips said, but continues to donate to the group regularly. When Straus announced his retirement in October 2017, Bonnen’s name immediately floated up as a potential successor. But earlier this year, he denied rumors that he was interested in the job — both publicly to reporters and privately to his House colleagues — and his history of butting heads with others led some to question whether he had the temperament to lead. After several others officially jumped into the race, a group of roughly 40 House Republicans met in October in hopes of finding a consensus speaker candidate. No one seemed to draw as much interest as Bonnen – who wasn’t even a candidate. Two days after that meeting, Bonnen was in. About two weeks later, the speaker’s race was over, as Bonnen announced he had the support of more than 100 House members to back his bid to be Straus’ successor. State lawmakers and politicos across the ideological spectrum are cautiously optimistic about Bonnen’s speakership, despite prior differences they may have had with him. Among them: Damon Rambo, a pastor who unsuccessfully challenged Bonnen in this year’s Republican primary, deeming him insufficiently conservative. Bonnen’s tentative coalition was on full display Monday morning, when he paid a visit to Tyler at the invitation of Schaefer, chairman of the House Freedom Caucus — a group that has been a thorn in the side of leadership last session. But Schaefer — as well as other Freedom Caucus members — have lined up behind Dennis Bonnen for speaker, and on Monday morning, the mood was jovial and hopeful as Schaefer and another area lawmaker, state Rep. Cole Hefner, introduced Bonnen to their constituents. When it was his turn behind the podium, Bonnen spoke at length about what he saw as the role of the speaker. All members, he said, should have a “fair playing field to be heard” — not to always get their way, but at least to be heard. Before he spoke, Bonnen took some teasing from Hefner, who jokingly said he “didn’t even have a driver’s license” when Bonnen was first elected to the Legislature in 1996. Bonnen, now 46, noted he was 24 back then and had his license for a few years. Disclosure: St. Edward’s University and Rusty Kelley have been financial supporters of The Texas Tribune, a nonprofit, nonpartisan news organization that is funded in part by donations from members, foundations and corporate sponsors. Financial supporters play no role in the Tribune’s journalism. Find a complete list of them here. This article originally appeared in The Texas Tribune at https://www.texastribune.org/2018/12/19/texas-house-speaker-dennis-bonnen-profile/.